Almond Eye did not disappoint in her international debut on Dubai World Cup Day at Meydan Racecourse in the United Arab Emirates, as the Japan Racing Association’s reigning Horse of the Year turned heads with an effortless victory in the Grade 1 Dubai Turf on Saturday. Almond Eye, the headline act among nine runners from Japan attending the world’s richest meet, picked up right where she left off last season, when the Sakae Kunieda-trained superstar became only the fifth horse ever to net the Japanese filly’s Triple Crown before smashing the world 2,400-meter record at the Japan Cup in November. Making her 2019 debut in the first overseas race of her exploding career, the 4-year-old Almond Eye showed no signs of rust in the 1,800-meter Dubai Turf in holding off compatriot and the race’s 2017 champion, Vivlos, by a length and a quarter to pick up a winner’s check of US$ 3.6 million. A third Japanese horse in the field of 13, Deirdre, took fourth place as Japan just missed out on a podium sweep. Kunieda failed to suppress a smile after his Lord Kanaloa filly, the betting favorite, lived up to top billing as she rattled off her fifth successive G1 win under Frenchman Christophe Lemaire. Almond Eye is the fifth Dubai Turf winner from Japan, following in the footsteps of Admire Moon (2007), Just a Way (2014), Real Steel (2016) and Vivlos. Lemaire barely broke a sweat as he watched his mount win the race on virtual auto-pilot from the saddle. Doing most of the work, Almond Eye left her stall smoothly, traveled mid-pack before safely avoiding traffic on the final straight to go under the wire in 1 minute, 46.78 seconds. Lemaire was comfortable enough and had the wiggling room to sneak a peak at the horses trailing behind him before cracking the whip a couple of times to ensure the win for his filly. “She was calm like she always is after the start. She started going on her own as we came around the bend. She was very responsive and finished out the race in her usual style. I knew we had it won with 400 meter to go,” said Lemaire, who also rode Rey de Oro in the Dubai Sheema Classic (sixth) and Derma Louvre in the G2 UAE Derby (fourth). Saturday’s performance further lifted the already high expectations for Almond Eye – out of the Sunday Silence mare Fusaichi Pandora - in this year’s Prix de l’Arc de Triomphe, Europe’s most prestigious race which Japanese racing covets more than any race on the planet, but has yet to capture. Japan has been runner-up four times in the Arc, El Condor Pasa in 1999, Nakayama Festa in 2010 and Orfevre in 2012 and 2013. “I want to take her to the Arc if everything works out so she’ll probably run somewhere in Europe before that, I think,” said Kunieda. 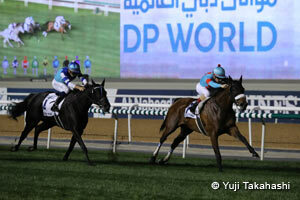 The Dubai Turf was also the swan song for 6-year-old mare Vivlos, who finished runner-up for the second straight year. Vivlos, trained by Yasuo Tomomichi and ridden by Mickael Barzalona, closed the race strong but came up short only because of the brilliance of Almond Eye. Tomomichi was also forced to settle for a silver medal in the 2,410-meter Dubai Sheema Classic with 7-year-old veteran Cheval Grand, who gained on Old Persian down the stretch but not enough to put his hands on the trophy. Taking third was Japanese compatriot Suave Richard with Rey de Oro, the 2018 Tenno Sho (Autumn) champion and the 2017 Tokyo Yushun (Japanese Derby) winner, flaming out to sixth in a party of eight. Cheval Grand’s Japan Cup-winning partner two years ago, Meydan debutante Hugh Bowman, lamented a poor jump out of the gate but said his horse had plenty of time to recover, crediting Old Persian where it was due. Tomomichi agreed with his jockey about the unfortunate start, but praised Cheval Grand for a strong showing in the Heart’s Cry son’s first race abroad. Neither Suave Richard’s trainer Yasushi Shono nor jockey Joao Moreira appeared to have any complaints about the effort level they saw from their 5-year-old horse, who won the G1 Osaka Hai last season and was the third favorite for the Dubai Sheema Classic. Shono and Moreira, nevertheless, regretted that a fading horse in front of them cut off Suave Richard early on, pushing him back as they traveled. Not as accepting of the outcome was Rey de Oro’s trainer Kazuo Fujisawa, who clearly had greater expectations from his 5-year-old star, having won two of the most prestigious races in Japan in the Derby and an Emperor’s Cup while coming off a narrow second-place finish in the season-capping Arima Kinen (The Grand Prix) last December. Fujisawa was looking for payback after Rey de Oro placed a distant fourth in the Dubai Sheema Classic last year but did not get it after his King Kamehameha son was pushed on to the lead as the race got under way. Lemaire, who had just led Almond Eye to victory in the previous race on the card, could not contain Rey de Oro throughout and as the pack rounded for home, his partner had run out of gas. In the 1,200-meter Dubai Golden Shaheen, Yutaka Take’s Matera Sky placed second, one length and a half out of first (X Y Jet). Take, no stranger to setting and breaking records, had hoped the 5-year-old Matera Sky would become the first Japanese horse to win the Dubai Golden Shaheen after his predecessors fared no better than fourth place in the past. 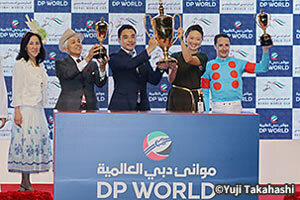 In the signature race on Dubai World Cup Day – the US$12 million Dubai World Cup – Japan’s K T Brave proved to be an unfortunate last-minute scratch after developing colic. K T Brave’s trainer Haruki Sugiyama did not bother to mask the disappointment over the situation of his 6-year-old horse. In another race involving a Japanese runner, Nonkono Yume was 10th out of 12th in the G2 Godolphin Mile.